Dusk in the evening sky witnesses history in an interior area of ​​Papua, precisely Puldama District, Yahukimo Regency. 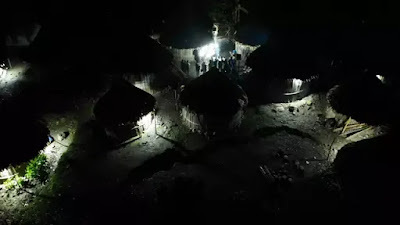 Unlike the previous nights, the lights that adorned the Honai (traditional house) of the Mamah-mamah Papua, spread light in the sky of Puldama. After 73 years of living in the dark, Puldama, Papuans can now become independent, can enjoy the light at night thanks to the presence of 1,085 packages of Energy Saving Solar Lights (LTSHE) in their area. Puldama District is one of the areas in the 3T area (frontier, outermost and backward), which is a priority for the distribution of the LTSHE program of the Ministry of Energy and Mineral Resources (ESDM). To get there, there is no road access that connects the center of Yahukimo District with the Puldama District. What is available is only a path through the forest and a gap that takes about 2 days on foot. Therefore, the only effective way to access locations is to transport logistics by relying on air lines. LTSHE was sent gradually to the region consisting of 8 villages, namely Kampung Puldama, Bako, Semlu, Kasen, Baro, Balsek, Eskok, and Pamek. To go to each village, the challenge is quite heavy. Each village is separated by hills or ravines, with access to and out of the district through a 600 meter long airplane runway in Puldama Village. From the center of Puldama district, residents who received LTSHE had to carry packages containing solar panels, 4 LED lights, cables / hubs, USB chargers, and supporting poles to their respective Honai.